I'm feeding them both Friskies & Fancy Feast along with dry food which neither of them likes. I don't know how long you've had your rescued older kitties, but it is not normal for us oldies to throw up food every day. I'd be sure to get them checked by a vet, and then get them on a different dry food (since they don't like the Friskies). Always check the ingredients list and try to buy a food where the first ingredient listed isn't a grain. Wellness is a good brand to try - there are others! Good luck! No offense since your intentions are obviously good - you're rescuing them in the first place after all, but what you're feeding them is garbage. As a rule, if you can buy it at Walmart, cats should not be eating it. The occasional bag of Pounce or Wiskas treats is probably forgivable, but they should have something better for their meals. Also, I would cut out the wet food. A LOT of cats throw up wet food. Get them a quality dry food - don't worry if they hate it at first - no cat has ever starved themselves to death that I know of, and see if the issue corrects itself in a couple weeks, once they get used to it. If not, get them to a vet. I'm going to respectfully disagree with Darwin. While there are foods that may be better quality than Friskies or Fancy Feast, I don't think it's a simple as garbage or not garbage foods. I eat Friskies because I refuse all other foods and so far I've lived 19 years so I don't think it's all bad. Mommy has also seen cats at the shelter who will refuse food they don't like (& if a cat goes 2-4 days without food, they can develop a life-threatening condition). Dogs are different - if you only offer one type of food for long enough, they'll eventually eat it. That's not always true with cats, so you'll want to be careful in switching diets. With daily vomiting, I think the suggestions to go to the v-e-t are quite good. It could be a food allergy, IBD, or something else that a prescription diet will fix, but only a v-e-t will be able to give a really targeted recommendation and they can give you advice on how quickly to make the switch to the new food. Good luck to the senior kitties! 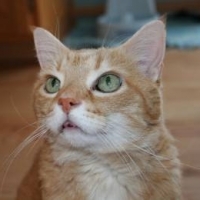 Senior kitties are prone to having hyper-thyroid, which your vet can diagnose through a special blood panel. One of the symptoms is throwing up food after we eat it, another is anxious activity (running around the house screaming, for me). Hyper-T is a common condition, kept under control with medication or cured by radio-iodine treatment. I also disagree with Darwin. Cats can and do starve themselves. it is not going to correct itself. In fact, cats that quit eating are prone to Hepatic Lipidosis, a life threatening problem. Do not ever let your cat wait it out..the mentality that cats will eventually eat is not true. As for the vomiting, you need to get to a vet. Although some kitties vomit dry food, especially if they eat really fast, it is not common for cats to throw up canned food. They often eat canned more slowly. Canned food has lots more moisture than dry and feeding them an all canned diet is fine. Be sure your vet does some blood work to rule out any metabolic reason for your vomiting. Cats can starve themselves to death! After not eating for a couple days, they begin to digest their liver (kind of like if people don't eat they can begin to burn muscle). This can be fatal to cats! Anyway, I'm sure that Friskies and Fancy Feast aren't the best foods, but they shouldn't make them throw-up. One of my kitties throws up his food when there's a hairball in there (sometimes the hairball comes up after the food, sometimes not). I would suggest treating them with kitty hairball medicine (read the instructions carefully!) if they seem otherwise healthy, and taking them to the vet if that doesn't work (or if they're not getting any food down at all, or seem otherwise ill). Hope that helps!